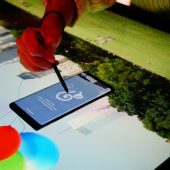 Samsung Galaxy Note8: Get Ready to Be Impressed! If you thought that the Samsung Galaxy S8+ looked like an impressive phone, then you’re going to positively drool when you get your hands on the new Samsung Galaxy Note8. This new flagship has a 6.3″ Quad HD+ Super AMOLED Infinity Display, and it’s not only gorgeous — it’s literally loaded with features. The Note series was first introduced in 2011, and since then each progressive device has become more and more impressive. I like a larger phone, and the Note8 manages to put a 6.3″ screen in a device that fits comfortably in hand. So what makes the Note8 so special? Well, beyond the fact that such a large screen is perfect for watching videos and reading eBooks without having to break out a larger tablet, the Note8 has an impressive processor, and it was made for multitasking. The Note8 has a new AppPair feature which allows you to “create a custom pairing of most apps on the Edge panel that will simultaneously launch two apps in Multi Window mode.” So if you like to look at your agenda while you’re in a conference call, for instance, you can. Or if you like to be able to keep your Viber texts open while reading an eBook (instead of switching back and forth as messages inevitably roll in), you can. Whatever makes life easier for you, pair the two apps and go from there. You can check your notifications without turning on your phone, thanks to the Always On Display. 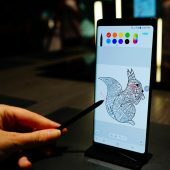 If you are a fan of the S Pen, you’ll like the fact that the Note8 has Screen-Off Memos, which allows you to take notes as soon as you remove the S Pen. You can then pin these notes to the Always On Display — editing them right there and writing as many pages (up to 100) as you need. The S Pen superpower that I’m most interested in is its ability to translate entire sentences when you hover over them with the S Pen! The S Pen can translate 71 languages and it can also instantly convert units and foreign currencies! Whaaaaat?! If you hate carrying a camera and a smartphone, you’ll love the fact that the Note8 has two 12 megapixel rear cameras with Optical Image Stabilization on both the wide-angle and telephoto lenses. I’m a firm believer in “the best camera you own is the one you always carry”, and for that reason alone I’m excited to see what this camera can do! Other features of the Galaxy Note8 camera include the ability to adjust and control the depth of field, bokeh effect, and even more! You can use both cameras in Dual Capture mode to take two pictures simultaneously — one is a close-up shot from the telephoto lens, and one is a wide-angle shot that gets everything in the background. The wide-angle lens has a Dual Pixel sensor with rapid auto focus, so you can capture sharp and clear shots even in low-light environments. The Galaxy Note8 is also equipped with an 8MP Smart Auto Focus front-facing camera for sharp selfies and video chats. Water and Dust Resistance: Four years ago, Samsung introduced the first Galaxy device with water resistance. You can take your Note (IP685) almost anywhere you want—including the S Pen. Fast Wireless Charging: Two years ago, Samsung introduced the first Galaxy device with wireless charging. The Galaxy Note8 supports our most advanced wireless charge6 capabilities yet, so you can get a quick, convenient charge without having to mess around with ports or wires. Security: Galaxy Note8 offers the choice of biometric authentication options—including iris and fingerprint scanning. Samsung Knox7 offers defense-grade security at the hardware and software layers, with a secure folder that keeps your personal and professional data separate. Powerful Performance: With 6GB RAM, a 10 nm processor, 64GB of storage and expandable memory (up to 256GB8), you have the power you need to browse, stream, play games and multitask. Innovative Mobile Experiences: Samsung DeX, sold separately as an optional accessory, enables a desktop-like experience, powered by your phone. You can keep your files on your phone, do your work on the go and use Samsung DeX when you need an even bigger screen. Bixby9 is a smarter way to use your phone; it learns from you, improves over time and helps you get more done. “Shut up and take my money,” right?! 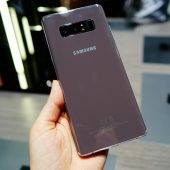 You’ll be able to get the Galaxy Note8 in midnight black and orchid gray from all of your favorite carriers starting on September 15th (there will also be a deepsea blue and maple gold —which may be harder to find at your favorite carrier); you can expect to see some decent incentives and financing deals from many of them*. An unlocked Note8 will cost $929.99. Samsung is also sweetening the deal with a choice of free gear when you buy one: You can get either a free Samsung Gear 360 camera ($229.99 retail value) or a free Galaxy Foundation kit with Samsung 128GB EVO+ memory card and Fast Wireless Charging Convertible ($189.98 retail value). Like all good things, the promotion will end at some point, but you can learn more about it by visiting here. U.S. Cellular will be starting its presale for the Samsung Galaxy Note8 tomorrow online and in stores. 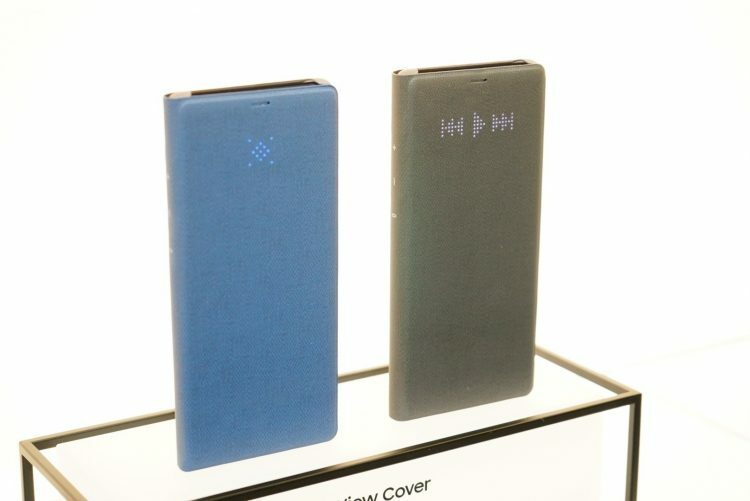 We will have the device in black and orchid gray, and customers who switch to U.S. Cellular and preorder it can receive a $300 promotional card. In addition, customers who purchase the Note8 between Aug. 24 and Sep. 24 are eligible to receive a free 128GB MicroSD card and Fast Charge wireless charger or the new Samsung Gear 360. Customers switching to Sprint get 50 percent off the lease price and pay just $20.00 per month with $0 down with 18 Sprint Flex payments1. Galaxy Forever allows upgrades any time to the latest Galaxy after just 12 SprintFlex payments, exclusively from Sprint. Customers who get Galaxy Note8 through Sept. 24 will receive their choice of a free Galaxy Foundation kit with a Samsung 128GB EVO+ memory card and Fast Wireless Charging Convertible ($189.98 value) or a free Samsung Gear 360 camera ($229.99 value). 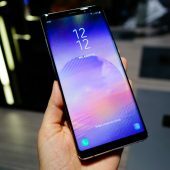 Preorder begins tomorrow at www.sprint.com/note8 with devices shipping as soon as Sept. 5. 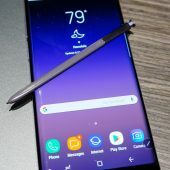 Galaxy Note8 will be available in all Sprint stores, sprint.com and 1-800-Sprint1 on Sept. 15. And starting on Friday, Aug. 25, customers who switch to Sprint get Unlimited data, talk and text, HD video and 10GB of mobile hotspot for just $22.50 per month per line for 4 lines with the 5th line for free. That’s 50% off Verizon and AT&T Unlimited rates for a family of 4 or 5.